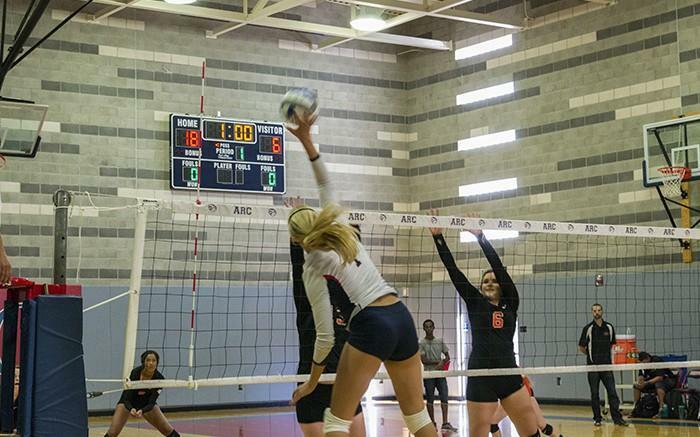 American River College’s volleyball team dominated Lassen College in its second of two matches Thursday by a final score of 3-0 Thursday as ARC thwarted Lassen’s attempt to rally in the final game. Lassen opened the scoring in the first game, but after that ARC took firm control of the match and went on to take all three games. The first and second game were easily won by ARC, but Lassen was able to rally from eight points down to bring the third game score to one at 21-20. After the brief scare, ARC quickly finished off the final game by a score of 25-21. New head volleyball coach Gabe Gardner praised the effort of several players for ARC. Christensen said she was happy with her team’s performance overall. “I think we came out really strong as a new team and we played really hard, (but) we still have things to work on and we’re looking forward to the conference,” said Christensen. Following the first two matches of the year, freshman outside hitter Candice Reynoso said the team has come together well. “The team feels very homey, we’ve all bonded quickly,” she said. Going forward, Gardner wants his team to stay committed to each other and maintain a positive attitude. “Commit to the process, work hard like we’ve been doing, and continue to believe in each other and that we’re going to be a good team this year,” he said. 1 Comment on "ARC dominates Lassen in second match of the day"